Han Solo is back in the cockpit of the Millennium Falcon. Clockwise from bottom left, you're looking at co-director Christopher Miller, Woody Harrelson, Phoebe Waller-Bridge, Alden Ehrenreich, Emilia Clarke, Joonas Suotamo as Chewbacca, co-director Phil Lord, and Donald Glover. Lucasfilm revealed that principal photography for the movie began on February 20. Despite rumors of a delay, the release date for the film is still slated for May 25, 2018. 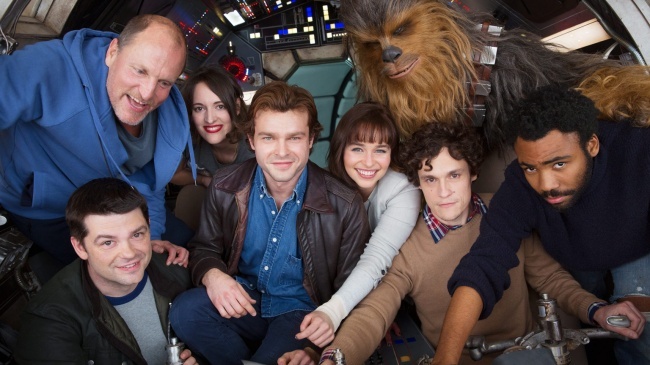 I must say I had my doubts about Alden Ehrenreich, being a relative unknown, but he looks almost natural as Han. What do you guys think?